Last Friday in February – THANK GOODNESS! Here in eastern Maine, we have experienced not just the snowiest month on record, but the coldest February ever recorded. And not just February- the coldest month recorded here. It got above freezing for one half hour this month. That is just ridiculous. All I can say is “thank heavens this month is over! Yesterday I went to Portland With Mom to knit with sister C. We stopped in Bath for a quick bit of yarn shopping. Actually, C asked us to stop and get a few bags of the knit loops used to make those fabulous potholders. Niece E was very excited to see them when she got home from school! I got out of the store with only one planned purchase – a cone of the silk yarn I used to make jewelry – Mom wants me to make a custom pair for a gift, and I didn’t have anything right for that person. Now I have sunny gold, which she wants to have some green beads. Not sure how I will like that, I might recommend some rust in there as well, we will see. I have to go to the bead store next week, see what they have that inspires me. We had a good day, just sitting and talking and knitting – and lunching, of course. That sister of mine can make the simplest meal so delicious. All with ordinary ingredients, but they taste better when she puts them out than when I do. 🙂 Plus, she serves it in the cups and bowls she has made. That makes it even more special. So, what’s on for today? 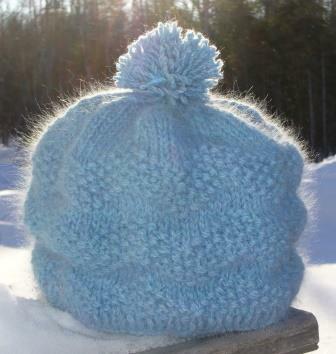 I plan to write up my notes on the angora hat and see if there is a pattern there. Then figure out if I want to sell the thing. I mean, I do, but there is work to be done ahead of that – that is what I want to figure out if I can do. 🙂 Lots of blog reading to do on the subject. I already called EBS and asked them to yes please, deliver a ton of pellets today. That is our 5th ton for this winter. Unbelievable how we have gone through them. (See first paragraph!) Hopefully, it will start to warm up, at least during the days so that consumption slows down. And we are so thankful that we have this stove and that it works and keeps our house cozy and warm. Author salpal1Posted on February 27, 2015 Categories how I plan to spend my day, what I am thinking about, what I am thinking about makingTags Etsy, family, keeping warm, knit, to-do list21 Comments on Last Friday in February – THANK GOODNESS! I know I filled you all in on the fact that I can’t do math when it comes to yardage (I am good on number of skeins, but had a brain cramp when it came to realizing all skeins are not the same), and I think I told you I spent a bit of time searching Ravelry for a match. In all of that process, I came up with an alternative, and ordered some yarn that I thought would look nice with my yarn of choice. I also reached out to a Ravelry user – the ONLY ONE with the right lot of yarn in her stash. The paler yarn came in the mail today. But I am not going to immediately cast on, because the wonderful Raveler emailed to say that she (I assume it is a she, I don’t actually know the name yet) would ship me the yarn in her stash. And she doesn’t want anything in return, it is just leftover from a past project! Now, I won’t let her generosity go unpunished unthanked, of course. I need to start thinking of ways to show my appreciation. If this was you, what would make YOU feel that your gesture was very much appreciated? Let’s not talk about the weather, OK? Here’s what I am working on today. It is going to be hugely warm as I am using Lamb’s Pride Bulky. Not what the pattern calls for, but what i had near at hand in a generous quantity. I had to seriously adjust the number of stitches, making the rows are nice and short, and the end product will be warm as can be. We won’t talk about why that is a good thing. I have never done double knitting before, but when I saw this cowl by Lisa Myers in Interweave Knits, I decided to give it a try. And I have been playing with black and white the past few days, coming up with an idea for a hat based on what I see out my windows – trees and that which we will not talk about. This just fell right into place with those thoughts and after I master this type of knitting, I plan to invent a hat and maybe cowl pattern. I already have a name for it, but no pattern yet. Creativity knows no order. Author salpal1Posted on February 25, 2015 February 25, 2015 Categories what I am making, what I am thinking about makingTags cowl, Double knitting, Interweave KNits, knit, Lamb's Pride, Lisa R Myers, winter10 Comments on Let’s not talk about the weather, OK? Without flash, you can see the design better. With flash, you can see the color better. 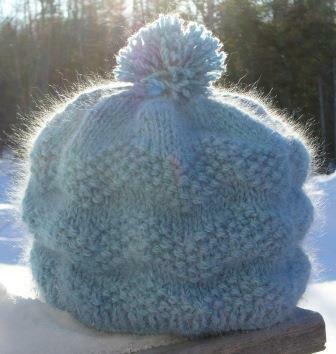 I used a whole skein of my precious wool/angora blend from Hidden Brook Fibers, in Stow Maine. It is sport weight, I held it double, and used every last inch of it. The chevron pattern is in seed stitch, over 90 stitches. I would be happy to share notes on how I did it if anyone else wants to recreate it. Just pop me a note and I will send you details. Don’t you just love how soft it is? Look at that halo! Author salpal1Posted on February 24, 2015 February 24, 2015 Categories how it came outTags angora, chevron, halo, hats, Hidden Brook Fibers, knit9 Comments on Look what I made! Oh, look, it snowed! How %^&*^(*&)*^^$%^$%#%$# pretty! 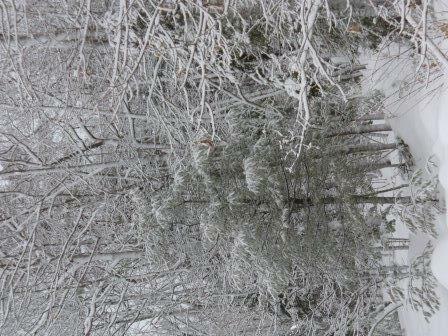 It actually IS pretty, and it is the kind of snow (wet) that sticks to things so you can see interesting shapes. And it gave me an idea for a hat design, which I might get to someday. I wish I could climb out there to give you a sense of scale. The little tree sticking out of the snow bank is probably 10-12 feet tall, maybe more. 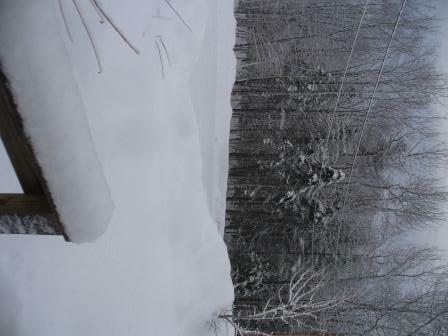 And it is on the edge of the drop off, so that pile of snow beyond it is many, many feet deep. Yards, even. I just wish we didn’t have to shovel it. But we do, and we worked on it all day so it is done. At least it was only 6 inches give or take, not a foot. No wind. And they got the prediction mostly right. 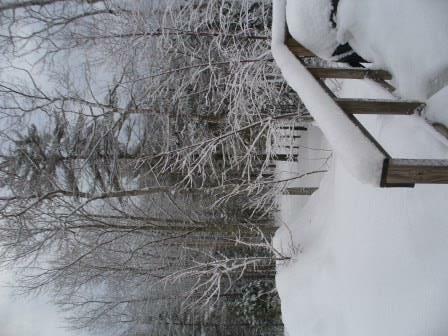 No mix, no rain, but today is a much warmer day – I actually shoveled the small deck without a jacket! I poked my head out while A was finishing up the path to the vent, and saw this in the tree. It let me go right out on the deck to take a photograph. 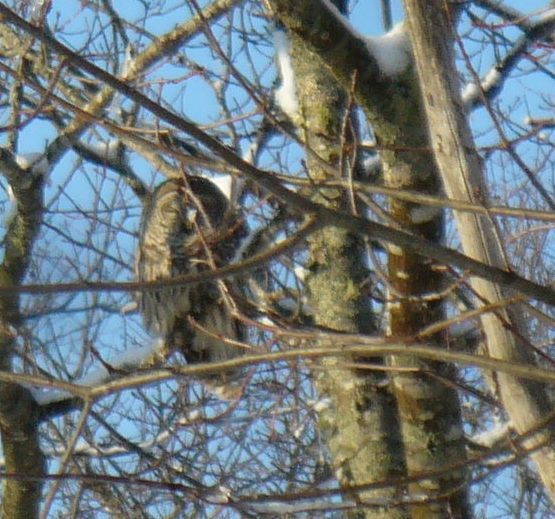 I wish I had a better zoom lens, but I think it is a barred owl. Is it normal for them to be out and about in full daylight? It was about 3 o’clock. Oh, the things you can see when it snows. 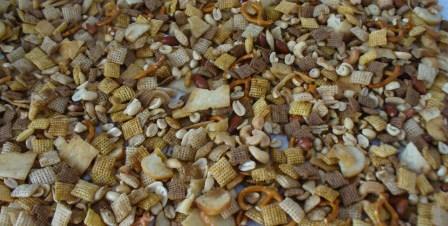 The treat we get for shoveling – homemade Chex mix and a rest in front of the fire. A did the lion’s share of the lifting kind of shoveling, so she also gets a hot soak in the jet tub. I mostly scooped and shoved snow around so she could throw it (nice of me, huh?) so I am not as sore. Other knitting news – I finished the back of the Charleston sweater, and found I won’t have enough yarn – argh! I thought I had one more skein, and even that would be cutting it close. So, I am stopped on that project for a bit, but I have come up with two solutions. I spent a healthy chunk of time (read all evening) on Ravelry, sorting through all the stashes to see if anyone has any in the right dye lot. One person does, and although she doesn’t list it as “for sale or trade” I wrote to her just to see if there is any way…then I hopped on the Halcyon site to see what colors they have that will look nice with it. Interestingly enough, they show a hat using this color and a soft peach. Next step – try to find it somewhere cheaper than Halcyon. That was pretty easy, in the end, and I ordered three skeins of the peach for about $7 a skein (it is 8.50 at Halcyon). I would have gotten it at WEBS, but they didn’t have the color. 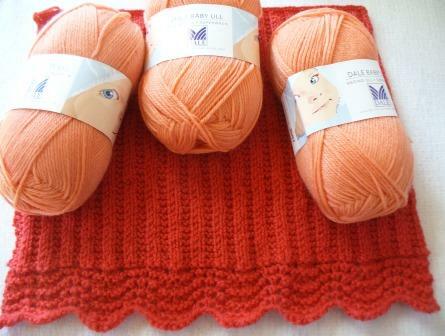 So, if the unknown Ravelry person can’t come through for me, then I will make quite a different sweater than I had planned – I will make all the border lacy bits and the two fronts in the dark reddish orange, but I will make the sleeves and the edging in the peach. Then, I hope I will have enough of the darker color to do the edge of the hat, but if not, I will do the hat in peach and search (high and low) for a ribbon the color of the darker orange to run through it. If that still doesn’t work, then, sigh, I will do what the Sweaty Knitter actually just posted about here and (sob) cut off the bottom of the back, knit the edge in peach and graft it in place. Yes, I could rip out the whole thing, but by then I would really be sick of the orange, and not loving the sweater like I am now. So you see, I will either get a bright orange sweater, or a color block sweater in peach and orange – two very different projects, but both would look nice, I think. Stay posted, and see what happens! And take my advice, always buy enough of the darned yarn before you start. Brrrr….good morning! 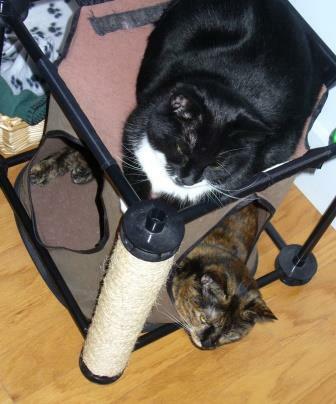 It’s so cold the cats are hanging out together in their “condo,” which rarely happens. I sit here looking out a frozen, snow-covered landscape, and can hardly believe that there is a possibility of Sunday’s storm being rain. That thought really frightens me, as following the storm we go back to arctic temperatures. What would we do with feet of ICE over everything? So, that gets me to the first thing on my list this morning. 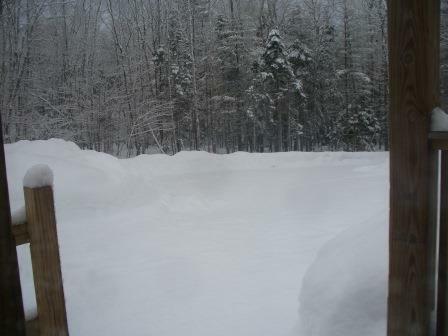 – Call the world’s best plow guy and ask him to come over this afternoon to clean up the driveway while we are both out. – I’ll be out, because I have to take A’s car in for servicing this afternoon. Just the regular 200,000 mile check up. I do love our Toyotas! – I’ll also stop at the grocery store for a few things they don’t have in our small-sized store. – Hit the PO, of course while I am out. 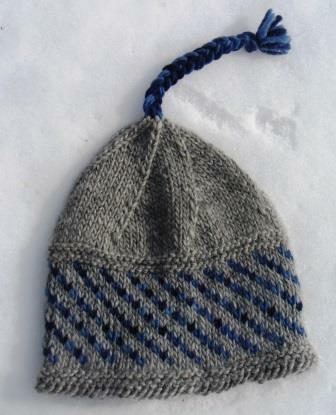 – Knit on the projects I have going, and cast on another hat. – Start the weekend laundry, of course. It seems I will be going outside today! I haven’t done that in a few days. I have been a regular couch slug, on this first real week of no work obligations. 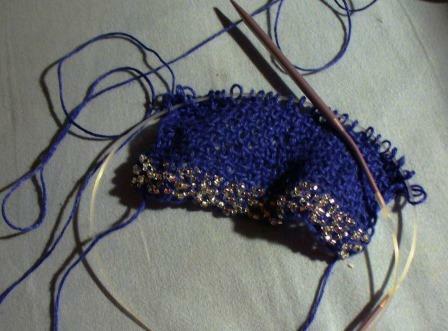 But my knitting has progressed, and I have cleaned all the Grey’s Anatomy episodes out of the DVR. I think I can finally say I have seen the whole series and am up to date on the comings and goings of Seattle Grace Hospital. These things are important, after all. It’s happened twice this week. The weathermen got all excited about a blizzard-like thing on Saturday/Sunday. We got wind and cold but no snow. Then they got all excited and predicted a foot or more of snow for last night and today. We woke up this morning to a revised forecast – 3 to 6 inches. They are predicting another storm for the “latter part of the weekend” One presumes that is Sunday, but for whatever reason, they are afraid to say so. Will anyone blame us if we ignore them on this prediction? Will anyone blame us if they suddenly get it right, but we ignored them, and so are unprepared? I hope not. After all, the tale has been around for ages. The boy who cried wolf is not that different from the weathermen who cried snow.